Posted by sneaks in coloring pages, J fiction, winter, YA. The Spiderwick movie opens this Thursday and it looks like a good one. It certainly has a fun web site, if that’s any indication. Plump up your display of books by Tony DiTerlizzi and Holly Black with other books about extra-normal creatures. Click “more” below for a short list. Simon & Schuster offers a variety of printable activities we might offer as pickup items. Posted by sneaks in coloring pages, J non-fiction, winter. National Children’s Dental Health month is here! Slide our special bookmarks into books from 617.6 and provide fun activity handouts from the American Dental Association and dltk. Posted by sneaks in coloring pages, display topics, Fall, J is for Juvenile. The State Library of Louisiana‘s Early Childhood Resources Department has produced a series of 24 one-page Printable Nursery Rhyme Mini Books for children to color and keep. Each mini book requires one sheet of 8.5 x 11 paper and just 2 folds. Please encourage staff to print them out and give them to children, parents, and teachers after programs, tours, presentations, as part of preschool outreach book delivery services, etc. Mini books by individual title. If you want to print out all 24 mini books, click here, but beware, it’s a giant (slow) PDF file. The State Library of Louisiana has other nursery rhyme resources, including an index to nursery rhyme related activities in resource books, a nursery rhyme product directory and web sites with nursery rhyme activities. Posted by sneaks in coloring pages, display topics, Fall. And don’t forget the “Let’s talk about it” bookmarks! Posted by sneaks in coloring pages, Fall, J fiction, J is for Juvenile, J non-fiction, summer. The Baltimore American Indian Center held its 33rd annual Powwow this weekend in Patterson Park. Search “powwow” in CARL for a small selection of books about powwows to headline a display about Native Americans, J 970.0049. Don’t forget the fiction: Joseph Bruchac, Louise Erdrich, and Marlene Carvell; the biographies: Sacagawea, Chief Joseph, Jim Thorpe, etc. ; and the folklore: look in J 398 for Bruchac (again), Gerald Hausman, and Anita Delal. Coloring pages here. Plus a word search! Posted by sneaks in coloring pages, display topics, J is for Juvenile, J non-fiction, summer. Talk about a road trip! As work continues on the International Space Station, members of the space shuttle and Expedition 15 crews will be out and about, bolting an important piece in place and making power and data connections. Books on space flight (629.45), plus astronaut biographies would make an inspiring display. Click “more” for a list of astronauts whose biographies BCPL has on hand. Posted by sneaks in coloring pages, display topics, E, J is for Juvenile, summer. Earth to Audrey / written by Susan Hughes ; illustrated by Stéphane Poulin. Block Party Today! by Marilyn Singer ; illustrated by Stephanie Roth. Root beer and banana / Sarah Sullivan ; illustrated by Greg Shed. One hot summer day / by Nina Crews. Think cool thoughts / by Elizabeth Perry ; illustrated by Linda Bronson. 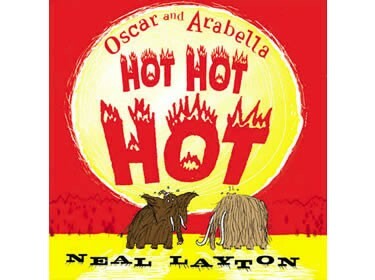 Heat wave / written by Eileen Spinelli ; illustrated by Betsy Lewin. Do parents and caregivers a favor with a few books on crafts and activities kids can do indoors. This time of year, most folks are fresh out of ideas! Posted by sneaks in adult, coloring pages, display topics, J is for Juvenile, J non-fiction, nonfiction, summer. Within three weeks Baltimore’s hometown hero, Cal Ripken, will be inducted into the Baseball Hall of Fame. Pay tribute to his career and the fervor it inspired with a display of anything Ripken you can find – once books like The Ripken Way (796.357 R) and Count Me In (J B R) are snapped up, fill in the gaps with Orioles books and baseball materials in general. Ripken’s career stats available from MLB. Baseball printable activities and coloring pages here. Posted by sneaks in coloring pages, display topics, J is for Juvenile, J non-fiction, nonfiction, spring. The Pride of Baltimore II, a reproduction of a 1812-era Baltimore clipper ship, docks at the Inner Harbor this weekend (free deck tours 10-3 Saturday June 2), then makes a stop in Annapolis on its way to the ASTA Tall Ship festival in Virginia. Welcome her back with a display of books about sailing ships and the War of 1812. Call numbers 387, 623, 910, and 973.52 are good places to look… and don’t miss the recent Mutiny on the Bounty by local author Patrick O’Brien (J 910.45 O) and The Mayflower Compact by Dennis Brindell Fradin (J 974.4 F). Here’s a coloring page of a tall ship. Posted by sneaks in coloring pages, display topics, J fiction, J is for Juvenile, J non-fiction, spring. Snowchief winning the Preakness, 1987. 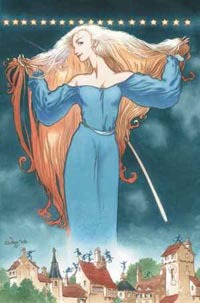 Carol Sauceda. Two jewels in horse racing’s Triple Crown, the Kentucky Derby (May 5) and the Preakness Stakes (May 19), are coming up soon. Wonderful horsey coloring pages from Windt im Wald horse farm. More here and here. Posted by sneaks in adult, coloring pages, display topics, E, fiction, J fiction, J is for Juvenile, J non-fiction, nonfiction, Picture Books, spring. 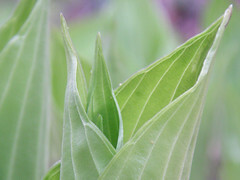 Environmentalism, once the province of school children and hippies, has entered our national consciousness in a big way. Environmental policies are part and parcel of many current issues, such as catastrophic weather, childhood obesity, cancer, global justice, and more. In addition to institutionalized recycling (in Western countries), cutting-edge venture capitalists are sinking money into wind farms, solar thermal energy, and biodiesel, and major automakers are developing electric and hydrogen-powered vehicles, in response mainly to consumer demand. Such noted personalities as Prince Charles and Al Gore are stepping up to be the poster boys for an expanded personal awareness of our environment, popularizing such concepts as our carbon footprint and global warming. Farmers markets, eating local, organic farming, and Community Supported Agriculture are becoming popular concepts as consumers become more aware of industrial farming practices and their effects on the environment. So move beyond Roots, Shoots, Buckets and Boots (although definitely, include it!) and make an Earth Day display full of new technologies and cautionary tales. Posted by sneaks in coloring pages, display topics, J fiction, J is for Juvenile, J non-fiction, Picture Books, spring. 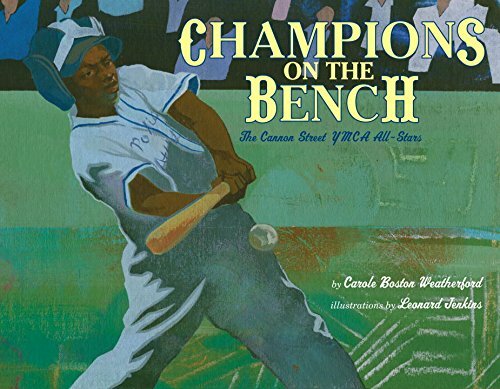 ALA has announced the second year of Step Up to the Plate@Your Library! Kid could win a trip to the National Baseball Hall of Fame and Museum! Posted by sneaks in adult, coloring pages, display topics, nonfiction, spring. Baltimore County’s 12th Truckload Compost Bin Sale will be held on Saturday, April 14, 2007, from 9am to 3pm at the Carver Center for Arts and Technology in Towson. 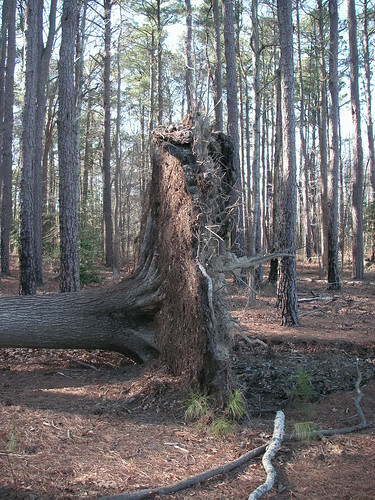 Baltimore County’s Growing Home Campaign web site provides tree planting and maintenance information and guidance to homeowners for adding trees to their property and offers a $10 coupon toward the purchase of a qualifying tree from participating retailers. If you have a stack of Baltimore County’s Growing Home Campaign brochures, why not display them with these shiny new tree books (click “more” for the list) and a stack of coloring pages. Harper’s Ferry, a good day trip from Baltimore County. Spring Break for Baltimore County Public Schools is April 6-15. It’s always a good idea to have extra coloring pages and activities on hand when you’re likely to get extra kids. But also, be sure to load up your displays of juvenile fiction, and take advantage of seasonal interest in baseball and basketball to push the sports books. And don’t forget the grownups! Many families try to get away for Spring Break, or at least take day trips. Pull out a few travel guides to the Mid-Atlantic, and maybe a couple of trail guides for Maryland and the Appalachian Trail. People who are staying home will also be looking for family-friendly activities – a selection of coaching manuals might be just the thing for parents trying to coax their kids outside. Posted by sneaks in coloring pages, display topics, spring. 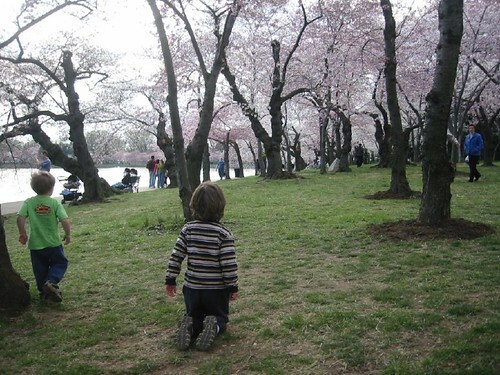 Sakura Matsuri, aka Cherry Blossom Festival, is just about upon us. In Washington, D.C., it runs from March 31 through April 14, with a parade on April 14. In Japan, early spring is graduation time. It’s a very important rite of passage in Japan, and so the first flush of blooms on the cherry trees signals a time of nostalgia and sentimentality. People visit their old schools and picnic under the cherry trees. The cherry blossoms are also considered the symbol of a life lived fully, no matter how short. You can participate in this gorgeous natural display online by visiting the blossom maps at the Brooklyn Botanic Garden or the National Park Service. Or make the drive down to D.C. to experience the magic in person. Go early – because of our warm weather in February, the trees are expected to blossom 1-2 weeks earlier than in the average year. In your library, it’s a good time to celebrate all things Japanese, as well as books on Asian gardens and flowering trees. Posted by sneaks in coloring pages, display topics, spring, winter. 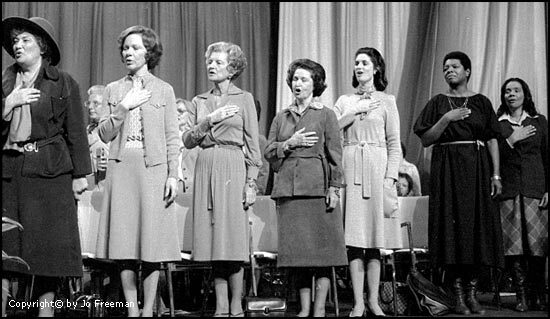 (above, left to right) Bella Abzug, Rosalynn Carter, Betty Ford, Lady Bird Johnson, Linda Johnson Robb, Maya Angelou, and Coretta Scott King recite the Pledge of Allegiance at the 1977 Houston Women’s Conference. The theme of National and Maryland Women’s History Month, 2007, is Generations of Women Moving History Forward, focusing on the legacy of the 30th anniversary of the groundbreaking 1977 Women’s Conference in Houston. With politics so much in the news, below is information about women in politics nationally and statewide. 71 women serve in the 435-member House of Representatives. In addition, three women serve as non-voting Delegates to the House of Representatives from Guam, the Virgin Islands, and Washington, D.C.
21 of these women are women of color. Posted by sneaks in coloring pages, J is for Juvenile. Now on Grooming Tips from Sneaks, we’ll be including links to coloring pages in our posts on seasonal display topics. In the meantime, here are a few online resources for fun one-page activities to hand out to kids. ColoringCastle.com: clean-lined, not-too-cartoony images – shapes, holidays, flags, etc. Posted by sneaks in coloring pages, display topics, J non-fiction, nonfiction, winter. 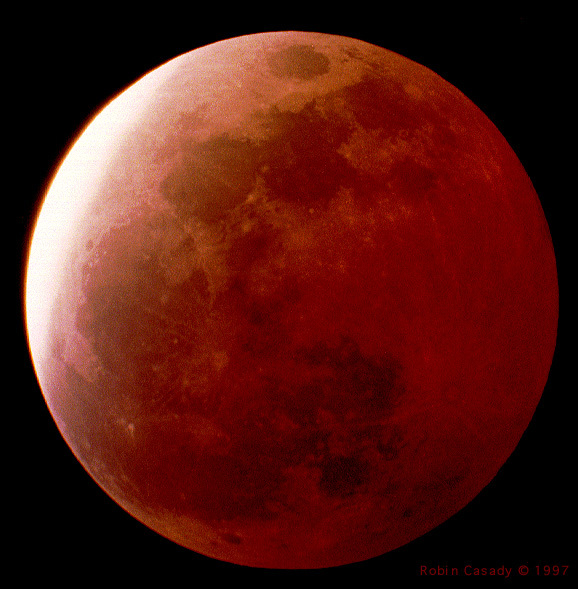 March 3, moonrise: that’s when you’ll see the full moon turn deep red. From the moon’s perspective, the sun will be blocked by the Earth, creating a ring of fire. That fiery ring will be reflected on the moon’s surface. It’s described by NASA as “extraordinary,” and you know when those scientists start rolling out the big adjectives it must be pretty special! Lunar travel, 629.454, especially If you go to the moon by Faith McNulty, illustrated by Steven Kellogg. Or take a different tack and pull out moon stories from your J 398s. Handout resource: A labeled lunar eclipse page. Posted by sneaks in adult, coloring pages, display topics, J is for Juvenile, winter.